I’ve spent time with hundreds of IT executives over the past several years, many of whom are in the process of implementing cloud-first operating models in their enterprises. Among the countless things I’ve learned from these conversations, two things are clear as it relates to this post: 1/ Enterprises want to automate IT operations as much as possible, and 2/ they want to do so using solutions that are familiar to them. This is why I’m so excited that we are integrating AWS Managed Services (AMS) with ServiceNow®, a cloud-based platform that many of you know and love. More details from the AMS team below (and special thanks to Mark Schwartz, Rahul Lele, and Forest Johns for putting this announcement together). Last year, we launched AWS Managed Services (AMS) to help enterprises operate at scale on AWS by implementing a standardized “Landing Zone” (an account configuration that includes authentication, network, and security designs), operating model, and common application stack templates for both cloud-native and traditional workloads. AMS automates common activities such as change requests, monitoring, patch management, security, and backup services, and provides full-lifecycle services to provision, run, and support an enterprise’s infrastructure. We designed AMS to meet the needs of enterprises that want to replicate the rigor of their on-premises environment in the cloud, including ITIL® processes, strict SLAs, integration with their existing systems/processes, and adherence to industry compliance standards. AMS uses standardization and automation to achieve consistent configuration and security outcomes. And with its recently awarded PCI-DSS attestation, AMS now provides eight of the 12 PCI requirements for processing credit card and financial transactions, so that customers only need to implement the remaining four application-specific requirements. Ultimately, the end goal of AMS is to help customers and partners remove the necessary — but undifferentiated — heavy lifting associated with infrastructure operations, so they can focus on their applications. In talking with a number of customers and partners, it became clear to us that they had a strong interest in using AMS via an IT service management (ITSM) solution. This would allow them to take greater advantage of existing ITSM investments while harnessing the benefits of AMS as part of their existing ITSM workflows. Having a single interface to consolidate day-to-day infrastructure operations and manage both on-premises and cloud resources within existing business processes was also very important to them. And, lastly, customers and partners requested the ability to easily synchronize information on AMS resources with their enterprise Configuration Management Databases (CMDBs). To help them achieve all these goals — and to accelerate their usage of AMS and AWS — we created an AMS integration app for ServiceNow, a modern, easy-to-use service management solution from the leader in the ITSM space. By installing the AMS integration app, customers and partners can now interact with AMS from within ServiceNow directly, without having to do any customer development or API integration. This means they can interact with AMS from inside ServiceNow to launch new AMS managed resources and make AMS changes that are fulfilled via automation. They can also use tickets to interact with AMS’ service desk to file requests and resolve incidents. 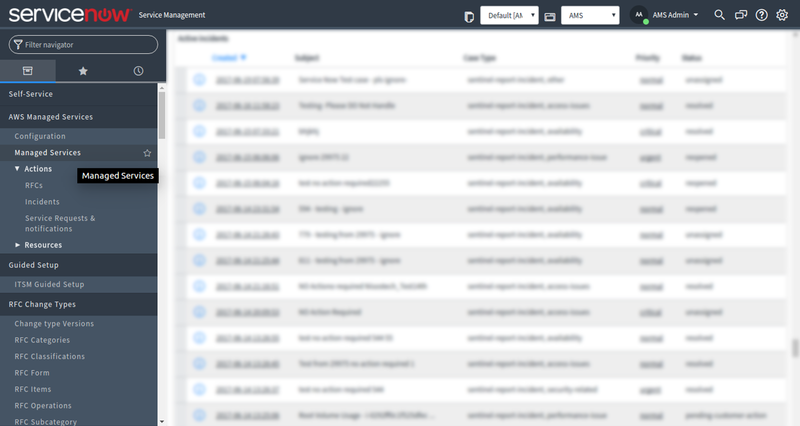 Because the AMS integration app for ServiceNow provides an out-of-the-box integration for AMS that easily connects the AWS cloud to ServiceNow, customers and partners no longer have to invest resources in building and maintaining a custom integration with AMS. Instead, they can focus resources on connecting their service management workflows to fully benefit from the agility of AMS and the cloud. The AMS integration app also frees up development resources to work on transformative applications for their users. Finally, by making AMS resource and action information available in ServiceNow, the new integration app enables enterprises to gain a unified view of all their configuration items in ServiceNow. Best of all, the new AMS integration app is an included service with no additional fees for AMS customers and partners, and can be found here.